In a recent post I was excited to report that the humble Probot moved 1cm for every unit input, and was keen to take advantage of this as soon as possible with my students during numeracy. Last week we were exploring scales and investigating the relationships between standard units of measure, and this seemed like too good an opportunity to miss. Over the course of the week our key objective was to be able to read scales to the nearest half division, and since we are Y3 as the week progressed I wanted the students to engage practically with a range of scales. The context chosen was linear measure, where we began practicing our use and appropriate choice of tools and units, Using rulers and tape measures, to estimate and measure to the nearest whole and half division, while also considering the relationships between the units. How many cm in a metre? All of which would help us to create and solve the problems we would be working on with the Probot later in the week. To work with the relationship between metres and cm, we carried out a group challenge to construct a skeleton of one member of each group. The students cut strips of sugar paper to represent two circumferences of the head, the length of the spine, each arm and each leg, the distance around the waist and three different measures around the chest, and across the shoulders. They estimated the length of each before using rulers to measure these in cm. Once the measuring tasks were completed the skeletons were assembled using a stapler. I mention this here because it was a task that really engaged the students, and which they really enjoyed. On Friday we were ready to use the Probot. 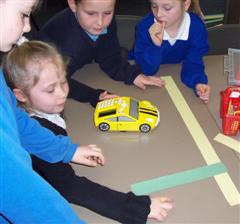 The session began with the students sitting around a large piece of card, a metre rule placed along its length, and the Probot bumper lined up with the start of the scale. The class were reminded of previous work they had done with BeeBots, and asked to identify the differences they could see between this tool and that. The students were asked how they thought I would get it to move and a little time was spent as we discussed and established how we needed to press the direction buttons and then use numbers, rather than previous experiences of repeatedly pressing direction buttons to move the turtle. The students were then asked to close their eyes, as I input fd 10, and then asked them on pressing go what they thought I had asked the Probot to do? We tested some of their suggestions, before confirming that I had pressed fd 10. What would happen then if I input fd 20, fd 30, could we predict where the Probot would stop. The students were asked to close their eyes again as I input fd 35 and pressed go. What had I input now? How did they know? Gradually we established that 1 Probot step was 1 cm. 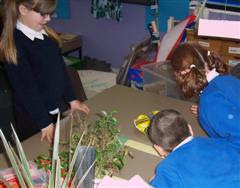 Next a pen was put added to the Probot, and the class talked through the inputting of fd 10 rt 90 fd 20. Before the go button was pressed the students were asked to discuss and predict what they thought would happen. 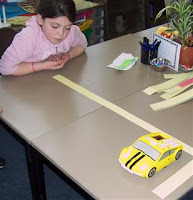 We then observed the trail left by the vehicle, and they were quick to recognise the right angle turn, enabling us to establish that this was the 90 (degree) input given with the right command, the 1/4 turn they were familiar with and had used with the BeeBot. For the main activity the students were organised into groups. Each group was given a Probot, a collection precut paper strips of different lengths and some measuring tools to choose from. They were challenged to make mazes for each other, that included only right angle turns. Their friends were then to be challenged to use the things we had learned from our carpet time to input accurate instructions to navigate their Probot through the mazes. Throughout the task the students used measuring tools accurately and with purpose, discussed and planned routes applying mathematical vocabulary beginning to predict and using reasoning about the choices they were making. Above all however they really enjoyed themselves.